This is quite a loaded question, and one that has resulted in many an online debate in design circles. Most designers will tell you that you absolutely should NOT DIY your designs, and that just because you can, it doesn’t mean you should. I don’t agree with this simply because you don’t actually need great design skills to create your own top quality designs. If you’re an established designer and don’t disagree with this, just hear me out. Most designers will also tell you that graphic design is a skill that takes years to perfect and that a program can’t think like a person and be creative. Yes, great design is a skill that needs to be nurtured – but this only applies if you’re creating your own designs from scratch. Also, design isn’t about being creative, it’s about solving a problem, visually. As Artificial Intelligence and technology advances, design as we know it today, will soon become a thing of the past and be taken over by automated software and apps. Actually, this is already happening. 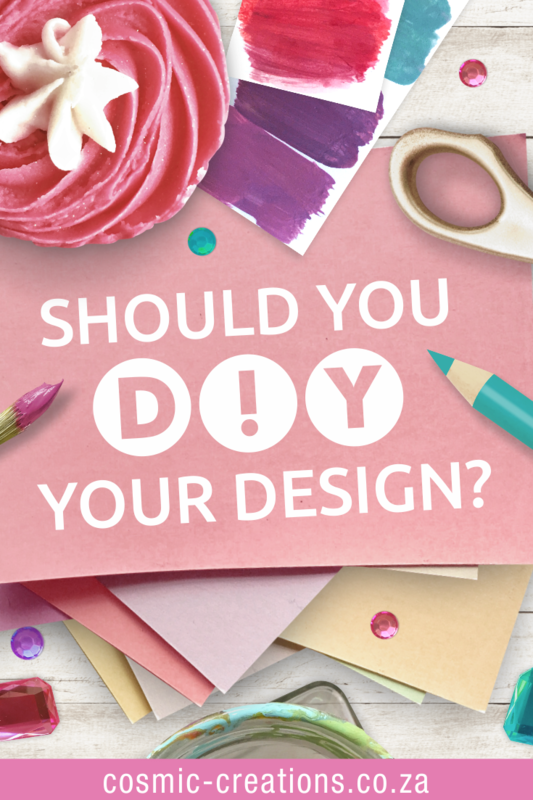 In the realisation of this inevitability, and considering the fact that there are some really great DIY design platforms out there, I fully encourage my clients to tackle their own design and I’m happy to teach them how to do it. These are my top 10 design pointers to help you decide if DIYing your own designs will be worth your while or if it’s going to end up being more of a headache than the time it’s worth. Online platforms like Canva and PicMonkey have a really good collection of templates you can use to create your own designs with. The template designs in these programs are created by professional designers and are generally well thought out and attractive. If you’re going to use them, then try to change them as little as possible. Keep the font type and size as used in the templates (only use your own if they are similar in style), and also the shapes and elements as they are because they already designed to have a good balance of elements. Once you change those, you’re going to mess with the overall design and the final result won’t be as great as the original template. These platforms also have free images that you can use to create your designs, and great interactive, fun tutorials you can try to help you get to know them better. Get to know your platform of choice well before you start DIYing stuff to share publicly. Once you’ve created enough designs using pre-designed templates, you should have a fairly good idea of what a great design looks like and, based on this, be able to create your own fairly decent designs. Don’t throw yourself in the deep end with PhotoShop or Illustrator or any other professional design program if you don’t already know the basics of design and design terminology. Not only will you end up being endlessly frustrated by not knowing what most of the tools are for and how to use them, your designs are not going to be of a level that will do your business justice. Know the purpose your design needs to perform. Is it to promote a product, share an inspirational quote, highlight a blog post, etc? This will determine the size and orientation your design needs to be. if you need to have text in your design, make sure it is the focal point, right in the centre, and then arrange any other elements around it. Actually sketch out your design on a piece of paper because it will make it much easier for you to find a template that will work, or to create a custom design if you’re at that stage. Please don’t use watermarks behind text. I don’t know why DIYers love to do this. It’s tacky and very distracting when trying to read the text. If you want your logo on your design, put it at the bottom, or to the side so it’s nice and clear and not competing with your main message. The only time you should use an image of any sort behind text is if the image is an emotive photograph and you’re creating an inspirational quote, a banner for your blog or a book cover. In these instances, don’t fade the image, rather pop a tinted transparent shape over the image, and then overlay your feature text on top of the shape in white if the background image is dark, or in black/dark grey if the background image is light. If you’re a photographer ‘watermarking’ your photos, do it discretely in one corner of the photos in solid black or white, not transparent, and not across the whole image. Firstly, stay away from decorative and scripty typefaces that aren’t 100% easy to read. As lovely as they are, if your reader can’t understand in a split second what your message is, they’re going to move on. The only time you should be using a fancy script is if you want your reader to read slowly, like an invitation or an inspirational quote. Never use scripts for important content, promotional text or article headings that you need to stand out and be legible. If you do have an occasion where a legible script will work in your design, then pair it with a very plain, easy-to-read typeface. Having everything in a script hurts the eyes. Use the script to highlight sections of your text, e.g. ‘Invitation’, Sam & David Jones’, ‘RSVP’. When you choose fonts for your designs, visit fonts.google.com and select your fonts from there. Especially if you’re going to be needing to create text-rich documents. If you use obscure fonts that aren’t common in documents and in your website, they will default to different fonts (depending on which fonts the viewer has on their system) and upset your text layout, making your design look messy and not in alignment with your brand. The easiest way to stick to your brand aesthetic is to build up a library of stock photos that reflect your brand and mirror your brand palette. Then use those stock photos in your designs. a regular font (for sub headings and paragraph text). Ideally, your black and regular fonts should be from the same typeface (e.g. Helvetica Black and Helvetica Regular), and should both be either serif or sans serif, not one of each. Make sure all your blog post banners look the same, using the same fonts. Your inspirational quotes for social media should look similar and use the same fonts. You can create 3 or 4 similar templates and just reuse them. If you’re creating digital freebies, or mini opt-ins, make sure they all look consistent. Canva has a new feature called ‘your brand’ where you can set your brand fonts, palette and logo files/variations. This is a great way to keep all your brand components in one place for quick reference. Search Canva’s templates section for moodboards to create yourself a moodboard that includes your fonts, palette and logo, set the page size to large, (A3 or A2), save it as a print PDF and have it printed out to display in your workspace to help you stick to it. 9. What about designing your own logo? This will depend on how fussy you are about having a really unique logo. There are loads of online platforms where you can just type in some details and a logo will be generated for you. These don’t take into account the needs of your target clients and what will appeal to them, or the functionality of the logo relative to how you need to use it. Plus the chances of someone else having the same logo as you is pretty high. This is one part of design where it is always better to hire a designer (at least until AI logo design platforms improve a lot and become affordable). It is possible to create your own unique logo in a program like Canva if you have a good idea of your target market and how to communicate to them visually, as well as knowing how to design a logo that will work over multiple media types. If you’re going to use a DIY platform or app to design your logo, and some parts of your logo include free elements from that program, then you will never be able to register your logo as your own because those elements will belong to company who owns the program. If you create your own elements, upload them and use them for your logo then it will belong to you. Most DIY design platforms don’t accommodate vector graphics. A vector is a graphic made of paths/lines and not pixels. When you enlarge a vector, you can literally make it any size you like without losing quality. A graphic made of pixels (jpg, png) will lose quality as it’s enlarged because the pixels will be come bigger as the image increases in size, giving you that pixelated, bitty effect. Picasso once said that good artists copy but great artists steal. But what does this mean? Copying is duplicating exactly what you see. ‘Stealing’ is taking pieces or ideas from a number of designs and combining them to create your own unique style. Even though design isn’t art, per se, this same principle can be applied to help you create your own unique design style. The best way to do this is to collect images of designs you love and that would work well in your brand, and refer back to them for inspiration when you’re about to have a DIY design session. Only take from them the parts you absolutely love, and don’t try to combine too many different style elements in one design. Before you know it, you would have developed your very own, unique design style! 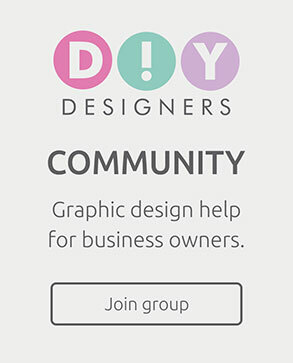 if you enjoyed this post and would like to learn more about how to DIY your designs, hop over to my DIY Designers membership Facebook group to connect with other business owners who are also DIYing their designs. The group is hosted by myself and my baby sister Vic, who is a designer too. See you inside.